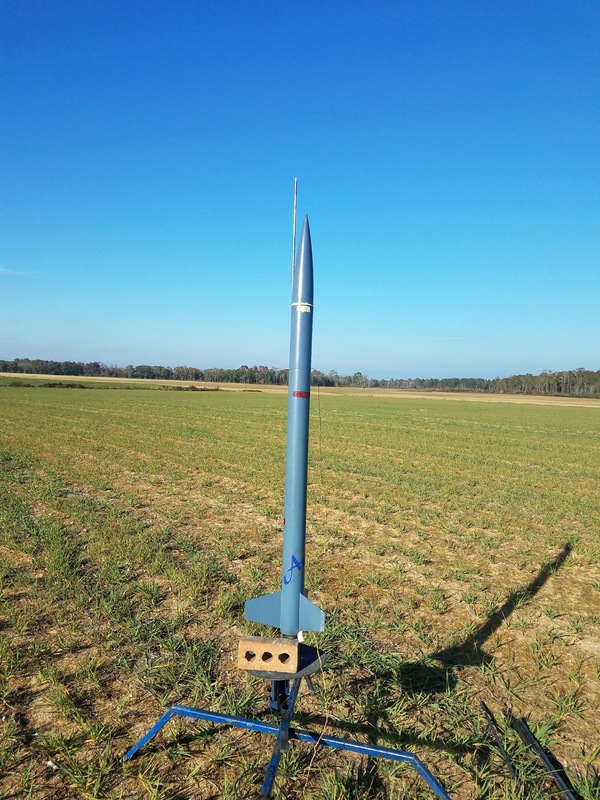 I launched a WSPRLite beacon on my hobby rocket at the Dec 2nd rocket launch in Samson, Alabama. Weak Signal Propagation Reporter, WSPR, is a tool to study radio propagation. WSPRlite is a stand-alone WSPR transmitter or beacon. There is a network of WSPR receivers worldwide that post spots of beacons to WSPRNet.org. I dreamed up an experiment to compare the reports of a beacon at altitude with a reference beacon on the ground. I chose the 20 meter HF band for this experiment. Question: What is the effect on the propagation of 20 meter radio waves using a half wave vertical at a significant altitude over ground level. Discussion: A rocket can be used to put a beacon at altitude for a short time. The rocket will ascend to an altitude of at least 1000 feet quickly and slowly descend to ground level under parachute. If I am lucky the chosen rocket will be elevated for the 2-minute transmission cycle of a WSPR beacon. The choice of rocket/rocket motors will affect the hang time. LNR Trail Friendly End Fed matchbox with a half wave (32 ft) wire exiting from the bay. 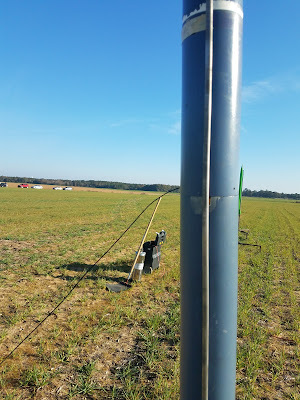 Setup the rocket payload WSPRLite with the half wave wire extended vertically to a support pole. Run the beacons for at least an hour. The WSPR system of receivers will establish the relative SNR delta between the two antennas. Start both beacons at an even minute. Launch the rocket about 10 seconds prior to an even minute. Capture the data from the WSPR database. See if the SNR delta between the two beacons is greater at altitude than during the ground calibration. At the launch, I ran a comparison of the rocket's beacon callsign N4KGL to a Bravo 7K vertical callsign W4RYZ on the field. The comparison report is at this link. Then, I prepared the PML Arial Rocket with an Aerotech I140 motor. The WSPRLite, a USB power supply, and a LNR Trail Friendly End Fed matchbox were in the payload. A 32-foot wire attached to the matchbox extended through a hole in the side of the payload bay. Notice the antenna wire extending out of the payload bay. The WSPR beacons transmit on a two-minute cycle starting on even minutes. I usually set the beacons for a duty cycle of 20 percent. If you start two beacons at the same time they will be synchronized. I thought I could set the duty cycle to 100 percent. That was not the case. 50 percent is the max. With a 50 percent duty cycle, I could not predict exactly when a transmit cycle would start. There seems to be some randomness at play. That made pushing the launch button at the right time a bit difficult. So we waited until an even minute came to hear the beacon tone start on my KX2. John Hansel, the Launch Control Office pressed the button with perfect timing. The rocket assent and decent under parachute were, fortunately, only slightly short of two minutes. The rocket landed safely on the field. The comparison report for the flight is at this link. The Rocket Beacon N4KGL was -1.76 dB relative to the reference Bravo 7K vertical W4RYZ on the pre-flight ground comparison. The Rocket Beacon, N4KGL, was +1.8 dB relative to the reference Bravo 7K vertical, W4RYZ, during the flight. Therefore the flight beacon was +3.56 dB on average in the air than on the ground. Standard deviations are noted in the report. It is worth reviewing all the details in the reports for the complete picture. I can at least say the trend of the data shows there is an advantage in elevating the beacon/antenna. I believe the rocket altitude was at least 1500 feet or up to 2000 feet. There was no altimeter was on board. I have had experience doing antenna comparisons during my study of the saltwater effect for vertically polarized antennas. I export the spots data from the SotaBeams Dxplorer.net website. Then, I import it into a Microsoft Access database. I developed the Spots Database to do the calculations and generate reports. The output is very similar and agrees with the results Dxplorer,net provides. However, those results eventually slip out of the time windows that the website uses. I can filter specific time periods for comparisons. I enjoy getting empirical data in these experiments to examine what I understand about antennas and propagation. This experiment was mostly for the fun of it. I may try kites or balloons to elevate a WSPR beacon in the future. WSPRlite is exceptionally easy to use. It is reliable even in near space. All this is a good exercise for my interest in rockets, radios and relational databases. Thanks for reading! 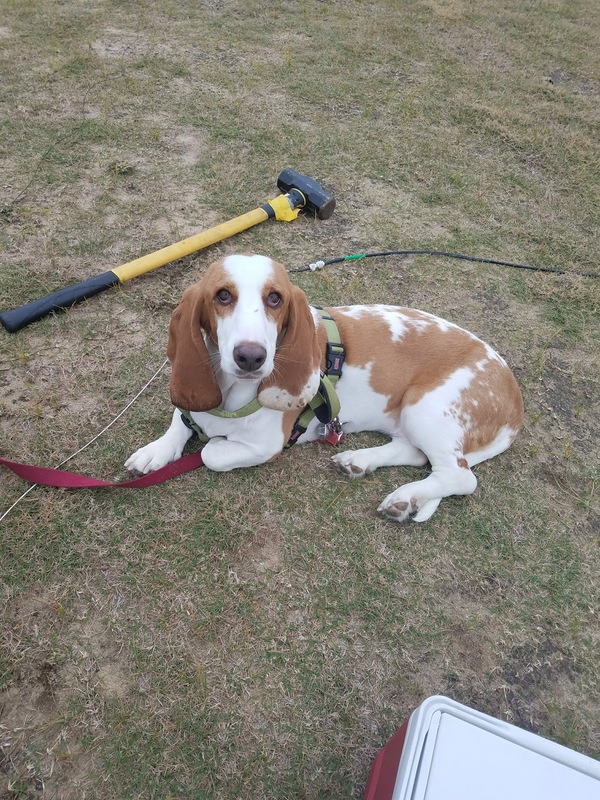 Suzy had a great time greeting the fliers and spectators at the launch.